It was a beautiful day when Bob Terrazas of Pictours Alaska drove up in his van. We headed out on a “Sunset Tour” to catch the “golden hour” of photography—around sunset. I’ve known Bob for a long time and he’s taking his photography skills and teaching folks to get better photos with their phones. Seriously—he comes up with great images! Our first stop was at the Alaska Wildlife Conservation Center where we saw bears, caribou, reindeer, elk, deer and a variety of other critters. 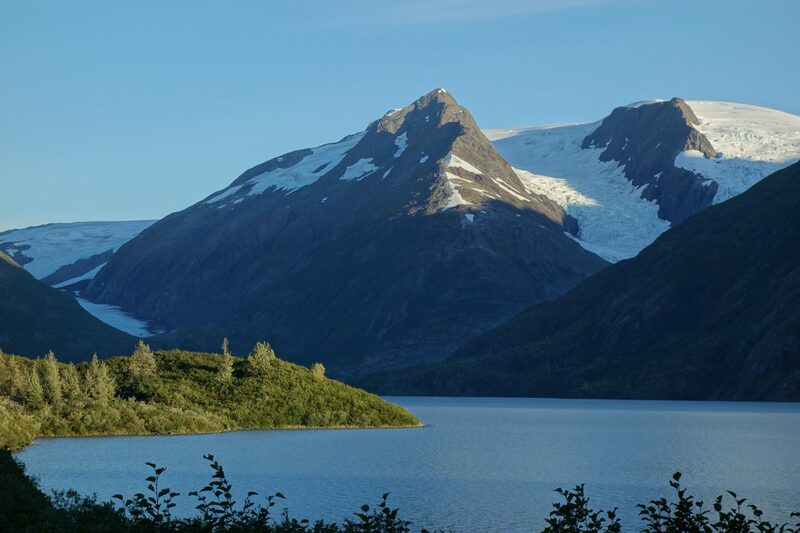 Then, we drove up Portage Valley for some beautiful shots of glaciers and spawning salmon. Bob’s not afraid to tell you how to get that perfect shot. Sometimes you have to get in close. Other times, you have to get close to the ground. And Bob’s pretty good at showing you how to use the “Pano” function on your phone! If you want some solid tips on taking better photos, go on one of Bob’s tours at Pictours Alaska. And of course—the views of the glaciers, of Turnagain Arm and the critters are big bonuses! Don’t take my word for it. Everyone who takes the tour writes a gushing review over at TripAdvisor.com .